LaMarcus Aldridge scores 48 points to help send Boston to its fourth loss in a row. 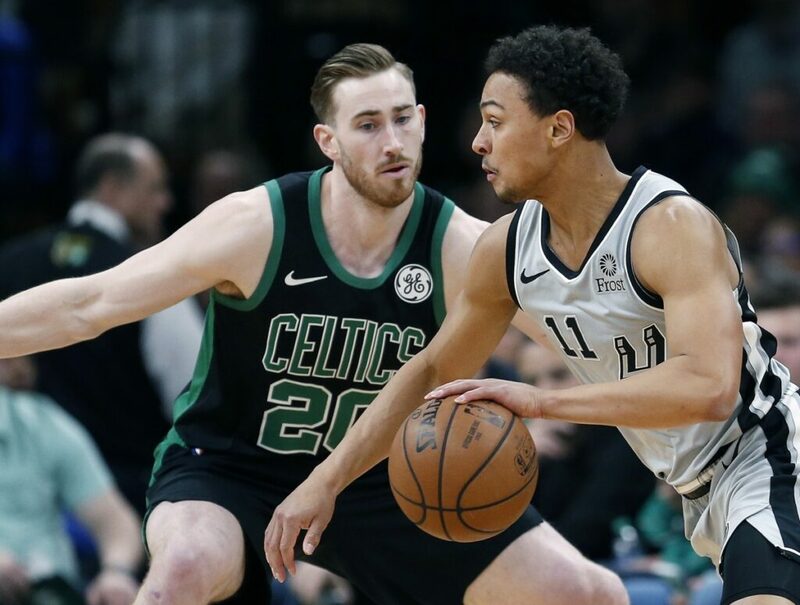 BOSTON — LaMarcus Aldridge had 48 points and 13 rebounds, and the San Antonio Spurs ran past Boston 115-96 on Sunday, giving the short-handed Celtics their fourth straight loss. Marcus Smart led the Celtics with 14 points. Kyrie Irving had 11 points and 12 assists but was just 5 of 17 from the field. Irving left the game briefly and went to the locker room in the first quarter with an injury to his left hand, but returned and played the rest of the way with tape on his left ring finger. Boston’s defense had little for Aldridge, who finished 20 of 31 from the field in 37 minutes. The Celtics got Gordon Hayward back from a concussion and Aron Baynes returned after missing a game because of a left ankle sprain. But Jayson Tatum (back contusion), Al Horford (left knee soreness) and Robert Williams III (back soreness) were all sidelined for a team that trails fourth-place Indiana by two games in the Eastern Conference standings. PACERS 124, NUGGETS 88: Bojan Bogdanovic scored 26 of his 35 points in the first half to lead Indiana over visiting Denver. Nikola Jokic recorded 19 points, 11 rebounds and eight assists, Will Barton had 15 points, and reserve Monte Morris scored 12 for the Nuggets, who had a six-game winning streak snapped. Bogdanovic scored every point during a 12-2 run late in the second quarter. He made a 3-pointer with 2:53 left in the first half to put the Pacers ahead 52-35. HORNETS 115, RAPTORS 114: Jeremy Lamb banked home a half-court 3-pointer at the buzzer and Charlotte won at Toronto. Toronto’s Kawhi Leonard hit a go-ahead basket with 44 seconds left, then blocked Kemba Walker at the other end. Walker had 15 points and 13 assists, and Willy Hernagomez finished with 13 points and 10 rebounds for the Hornets. BUCKS 127, CAVALIERS 105: Giannis Antetokounmpo showed few signs he was bothered by an ailing right ankle, getting 26 points and 10 rebounds to lift Milwaukee over visiting Cleveland. Antetokounmpo was listed as questionable after missing two of the three previous games because of an ankle sprain. He made 11 of 16 shots and had seven assists in 32 minutes. ROCKETS 113, PELICANS 90: James Harden scored 28 points in a little less than 29 minutes, and Houston won at New Orleans. CLIPPERS 124, KNICKS 113: Danilo Gallinari scored 26 points to extend the best scoring streak of his career, and visiting Los Angeles got its fifth straight victory. Lou Williams had 29 points and fellow reserve Montrezl Harrell added 24 to provide their usual potent play off the bench for the Clippers. Gallinari, the Knicks’ first-round pick in 2008, has scored 20 or more in his last nine games. He made a 3-pointer with 4:12 to put the Clippers ahead for good, 106-104.